When seeing Heather Trimlett's brilliant vessels for the first time with their intricately woven latticino embellishments, or remarkably ornamental buttons of varying sizes and keen layers, it's difficult to imagine their origins: fire, glass…and Heather's imagination. Heather has been creating lampworked beads since 1994, and she works out of her at-home studio - a converted portion of her garage in El Cajon, Calif. - busily cultivating the images of her imagination into colorful and illustrious glass bead realities. Beadmaking is all about having fun for Heather, and her beads capture her vibrant personality and enthusiasm. This might explain their bright hues and diverse textures. In fact, each finished product is a visual smorgasborg. Her beads contain designs that range from two-color twists and raised bumps to delicate floating murrini images. Technical challenges are no match for Heather. She faces them head-on and prides herself on maintaining a clean, tight design. What's most important to her is staying true to her mantra, which she describes as "bold contrast." 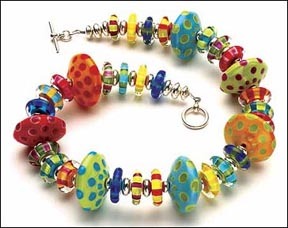 She explains, "The high color contrast gives the beads punch, drawing you in for a closer look. Once you have arrived you can enjoy the details, of which there can never be too many!" People often ask her where she gets her ideas. She usually quips that eleventh-hour creativity is the real secret, but they primarily come to her when least expected, such as when she is stuck in traffic or hiking with her giant Schnauzer. Color choices might stem from a random pile of glass lying on her table or a friend's luxurious garden. Heather is able to convert enough of her ideas into actual beads to satisfy the demand of consumers, artists and gallery owners that clamor to get their hands on her tiny sculptures. She's sold her work to thousands of customers throughout the last decade, and is renowned in not only the U.S., but internationally as well. Heather's work has garnered quite a bit of attention in the past 10 years. She's appeared in various trade and consumer publications including, The Washington Post, Bead & Button Magazine, and Glass Art Magazine. Most of the books written on lampworked beadmaking feature Heather's work, among them: The Complete Book of glass Beadmaking, by Kimberly Adams; Formed of Fire, by Bandhu Dunham and The Brightly Colored Beads and Vessels of Heather Trimlett, by Jim Kervin. Written exclusively about Heather, the latter is considered by many to be an industry must-have and is available to anyone who is hoping to gain insight to a professional's secrets. She's shown her work in numerous galleries across the U.S., most notably, Arts Afire in Alexandria, Va; Kittrel-Riffkind in Dallas, Tex and the Dennison-Moran Glass Gallery in Naples, Fla.
Of the Heather Trimlett originals for which she's famous, her highly evolved, multi-faceted amphorae vessels remain the most unique. Inspired by amphorae vessels used by ancient Egyptians to store cosmetics and essential oils, Heather's miniature replicas resemble -quite ironically - proud women standing tall with their hands on their hips. And she's quickly gaining accolades for her newest venture in glass buttons. About two years ago while attending a conference for the Society of Glass Beadmakers, she saw a demo on glass buttons. This new design concept piqued Heather's interest. She has since begun fashioning her own glass buttons, incorporating her signature, one-of-a-kind style to each one. Not only has she added glass buttons to her repertoire, she teaches a glass button course, which she says she loves doing. Actually, Heather's been teaching for some time. It makes up another major part of her craft, second only to working in her studio. A natural instructor - encouraging, demonstrative and patient - Heather has packed classrooms and studios in San Diego and across the U.S. throughout the last decade, offering step-by-step instruction in lampworked beadmaking to individuals of all ages and skill-levels. The most rewarding aspect of this endeavor for her is her students' reaction to having created something fascinating and eclectic. "I love the end of the class when they string up their beads and put them around their necks, pumping out their chests with these big grins on their faces, amazed at what they've accomplished," she says. Lampworked beadmaking involves molding colored glass rods into formations of all shapes and sizes using a special torch. Though it's a 400-year-old industry, it only recently began to gain popularity in the U.S. during the 1980s. Heather discovered this unique art form in 1992 in a class paid for as a birthday present to her. After practicing on her own for a number of years, word of Heather's exceptional work spread. Soon thereafter she made her first big sale, which catapulted her into a second career quite unexpectedly. Prior to this she had run a successful business fashioning stained glass for restaurants, synagogues and upscale homes. But after making her first big bead sale she found herself declining a stained glass commission offer. "I don't do windows anymore," she said. No doubt Heather Trimlett loves making beads and has no intention of slowing down anytime soon. As long as she is physically able to work on the torch she'll continue to awe people with her creations - constantly reinventing new color schemes, illuminating patterns, and unique shapes. And for that the world is a brighter, bolder, more whimsical place.